If nothing else, this psychedelic relic has a very colorful back story... The group Spectrum were one of many bands drawn into the orbit of Brazil's coastal hippie colony Nova Friburgia, Rio's version of the Dutch alternative lifestyle enclave of Christiania. 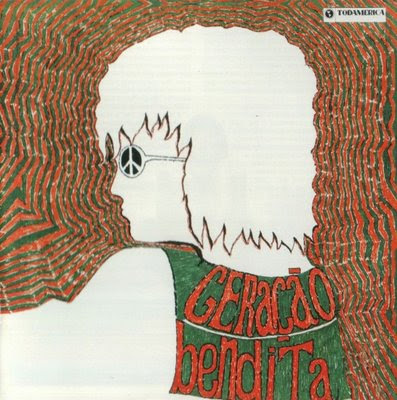 What distinguished Spectrum was that they were chosen to provide the soundtrack to Carlos Bini's documentary film, Geracao Bendita,which captured the chaotic idealism of the experimental commune. The music itself is pretty good, with loudly aggressive acid rock guitars, more in line with the hard rock and proto-metal of Iron Butterfly and Led Zeppelin than with the Beatles-y tendencies of the MPB-bound tropicalistas. On the downside, it should be noted that the band had a guitar player who somewhat opportunistically went by the name "Caetano," which was fair enough since his real name was Jose Luiz Caetano de Silva... Except that the infinitely better-known tropicalia founder, Caetano Veloso, was at the time a national martyr, living in exile for his opposition to the military regime that took power in 1964. A little misleading, to be sure. At any rate, this disc is worth tracking down, as very few Brazilian bands hit such heavy, fuzzed-out psychedelic heights. Fans of Os Mutantes, etc., will efininitely want to check this out.